Like all good Singaporeans, chilli crab is a perennial favourite of mine, and for the past many years, chilli crab has appeared on the fusion pasta menu in some chic restaurants. One of the earliest restaurants that offer fusion pastas must be Wild Rockets, which was serving fusion pastas like laksa pesto many, many years back. Often enough. 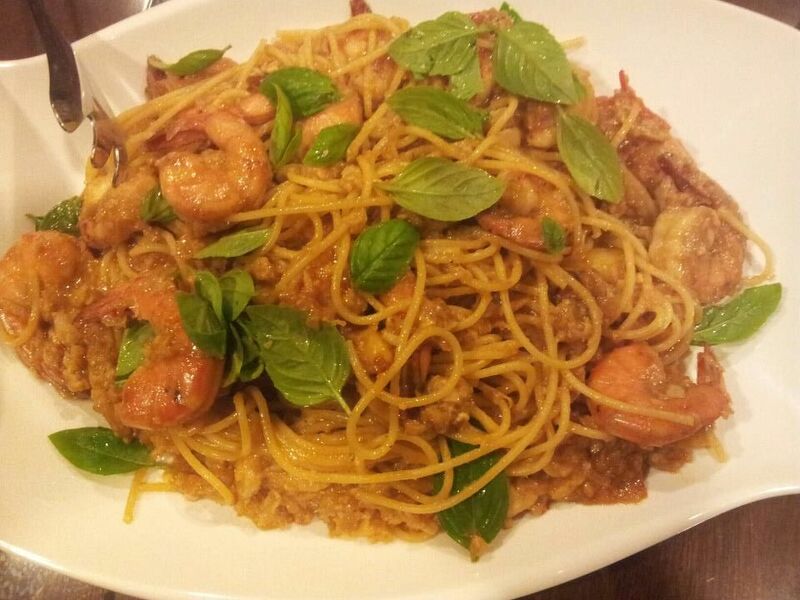 after having a feast of chilli crabs, we save some sauce & bring home & toss it with pasta. It is not quite my favourite pasta, but I like it enough to be motivated to try. The most difficult part is the the chilli crab sauce. I googled the recipe, but I am NOT about to buy or cook crabs (something I am not convinced is worthwhile doing as good chilli crab restaurants are everywhere) just to cook a pasta. So I will have to improvise. As my family use a lot of prawns in cooking and have been throwing away the shells for the most part, I thought I can use prawn shell stock (from boiling the prawn shells & heads for 2-3hrs) as a proxy to crab. I adapted the recipe below for my purpose. The chilli crab sauce involves frying chopped shallots, ginger, garlic & chilli padi, adding a mixture of ketchup, chilli sauce, oyster sauce, shaoxing wine, vinegar. lime juice, and then adding prawn shell stock. 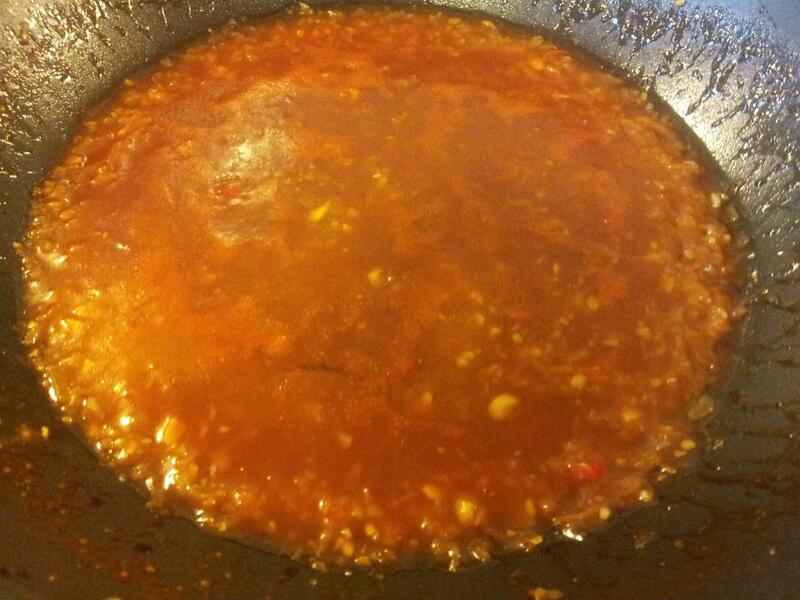 before serving, beat 1 egg & stir in to mix well with the chilli crab sauce. I got it right in my first attempt and am able to reproduce it without difficulty every time. I add shelled medium prawns with tails on and frozen crab pincer meat from NTUC Fairprice or Sheng Shiong but they are not very satisfactory and can do without (good quality canned crabmeat is very expensive, like S$20 for a 400g can). mix the ketchup, chilli sauce, oyster sauce, shaoxing wine, vinegar. lime juice in a large bowl. finely chopped the shallots, ginger, garlic and chilli padi (or pulse till finely chopped in a food processor). add oil to a large wok over medium heat. and fry the chopped shallots, ginger, garlic & chilli padi for few minutes. stir in the prepared mix from the large bowl, reduce heat and simmer of 3 or 4 minutes. add the prawn shell stock, bring to boil, turn off the fire and set aside to use when required. before use, beat 1 egg and stir in & mix well. Prepare the spaghetti– add some salt & oil to water and boil the spaghetti according to timing instructions & drain in a colander. Cook – empty the prepared olive oil & browned garlic into a hot wok. pour the chilli crab sauce into the wok. heat briefly then turn off the fire, add in the spaghetti & toss & add sea salt to taste. Place the spaghetti in a serving dish and garnish with fresh coriander. This entry was posted in Recipes and tagged chilli crab, spaghetti. Bookmark the permalink.